FeLV is commonly referred to as the ‘friendly cat disease’ since it’s transferred via saliva. Your cat can catch FeLV through sharing water bowls or even grooming an infected cat. On the other hand, FIV is transmitted through bite wounds and cat fights. Since males tend to be more involved in territorial fighting they are at an even higher risk of catching FIV. It is imperative to note that these viruses cannot be passed on to humans, dogs or other pets. Feline immunodeficiency virus closely resembles HIV in humans. The virus attacks your cat’s immune system and may not show any signs until several years later. Another sinister aspect of FIV is that the symptoms can mimic other common illnesses, making it even harder to detect. FeLV is somewhat different in its plan of attack. Feline leukemia virus goes after your cat’s genetic coding. This maneuver allows the virus to continue to reproduce infected cells at an alarming rate. Some cats are able to eliminate the infection before becoming sick. Other cats will carry and spread the disease despite never getting sick themselves. This virus can hide in bone marrow until it eventually surfaces in the form of many general symptoms. There are several warning signs associated with FeLV and FIV; however, not every infected cat will exhibit the same red flags. Your cat may initially develop a fever or become suddenly and extremely fatigued, important indicators that something may be wrong. Other chronic issues include respiratory infections, dental and gum infections, bone marrow issues and certain cancers. Also, if your kitty starts losing weight, having chronic diarrhea, or develops chronic infections of the skin and eyes, make an appointment to see your vet immediately. Your vet will perform a SNAP test to accurately determine if your cat is infected with FeLV or FIV. The test is quick and requires only a small blood sample. FIV is predominantly diagnosed through this blood sample alone. A bone marrow sample, in addition to the initial blood sample, may be required to successfully determine a positive FeLV result. Since FeLV and FIV are so complex, re-testing may be necessary. For example, if a kitten’s mother is infected with FIV or FeLV, the kitten may test positive at a young age. However, over time, their immune systems may be able to fight and overcome the infection, eventually resulting in a disease-free kitty. In contrast, if the FeLV virus is in the early stages and has not fully developed, it may not show up in the initial results. Later tests, further into the virus’ progression, will ultimately lead to a clear diagnostic result. Early detection, treatment, and proper nutrition are essential for your cat to live as long and comfortably as possible. If your feline does test positive for FeLV or FIV, then they will require premium nutritional support since their bodies will be stressed and weakened from the virus. Make sure that the food you feed provides an optimal balance of vitamins, proteins, and antioxidants, to give your feline the best chance at maintaining strength and general well being. In cases like these, pet parents should strongly consider augmenting meals with nutritional supplements to further boost health and vitality. If your cat tests positive for FeLV or FIV, I recommend that they make the transition to strictly indoor living. When immune systems are compromised, going outdoors could increase their risk for catching other viruses, parasites, or infections. Your cat will also be in harm’s way if they sustain any wounds from cat fighting or other traumatic events. Resulting injuries may not heal properly and might even become infected. 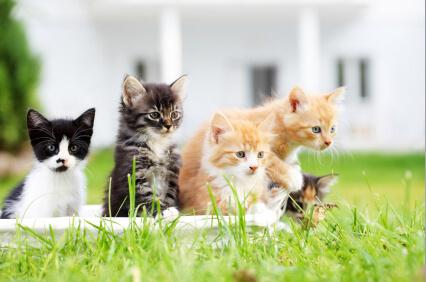 You should isolate any infected cats or kittens from other cats to avoid further contamination. It is essential to test any new cats or kittens that you may be bringing home for FeLV and FIV. As a feline pet parent it is great to provide your cat with the independence that they crave. However, you should pay close attention to any changes in the overall health or physical appearance of your outdoor cat. Early detection could be the key to saving your cat’s life.